A land steeped in mystical stories and the land of gods and goddesses. Let us not forget how important the goddesses were. Hi-five for mythical equality. 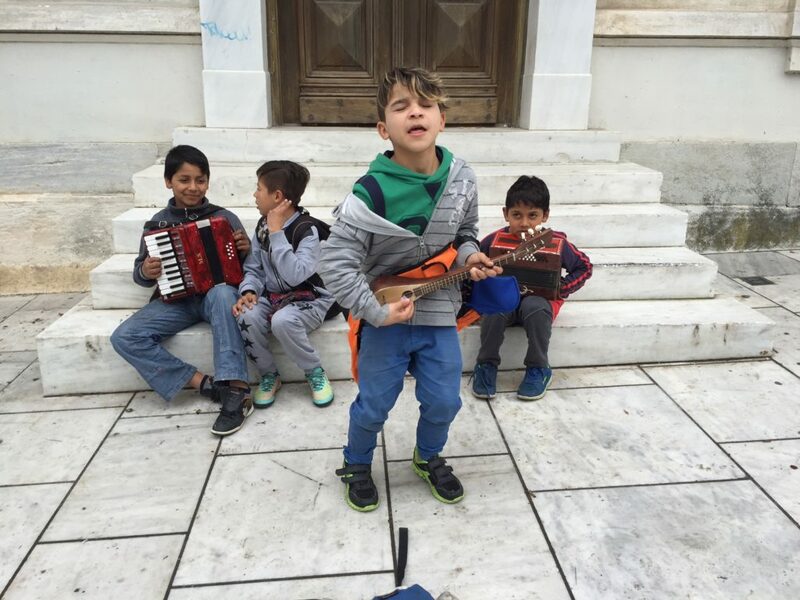 While walking to the Acropolis to see the remains of the Parthenon and to learn all about Athena and her amazing goddess qualities, I stopped to watch some kids on the street making music and playing their hearts out. Actually, I couldn’t help but stop because they were really good and having the best time. I just saw smiles, heard laughs and good music – it drew me in. So I gave them a couple of Euros. Not because they asked, but because I enjoyed what they were doing. After taking the tour and learning about a history so far away, my husband, baby and I settled into a nice cafe to enjoy happy hour with a beautiful view and even nicer weather. And then a kid approached us playing the accordion. Only this time it was obvious she was’t doing it because she loved its – she was doing it for the money. Which got me thinking. I’ve worked at a job to get paid, and I’ve done and still do something I love to do and happened to get paid for it. And I have to say, the latter is the better way to go. But how many of us stay stuck in a place because of the paycheck? In a society driven by money and by how much of it we can accumulate and spend, the art of doing something because it feels good has taken a back seat. The paycheck comes first, what we really want to do comes second. When we do what we love it shows up so much better in our work. Those boys loved playing music, but that girl hated it, I could just tell. And that’s okay. We’re all meant to do different things. But how many of us are brave enough to do those things? We have entered into a land where money rules, regardless if we’re happy making it or not, so it takes courage to step out and say no and stand up for what we love. I know this isn’t an easy 1-2 step, but there’s something to be said for questioning our happiness and deciding to make a change. It’s scary, I know. (I just wrote a whole blog post about being scared.) But isn’t life about being happy? This is why we signed up to be here – because there is happiness to be had and our natural born gifts and talents bring us to that very special place of happiness and contentment. When we become self-realized and use our gifts to their highest good, we can’t help but be happy. And that reaches much further than anything a paycheck can buy. I know we all have bills and things to take care of, but even taking one step toward something that makes you happy is better than ignoring it. Stepping out to that place and not losing focus gives us courage and the realization that happiness that comes from within is worth more than any dollar we will ever make. So I’m going to wrap this up here. Because I think it’s enough and because I think you know what you love to do and I think you’re ready to do it. And if you happen to be one of the lucky ones who’s already doing it, keep doing it. You inspire more people than you know. I learned today that Athena was often accompanied by Nike, the goddess of victory, so I will leave you with these three final words. Do what you love and victory will be yours. PS If you like what you read, please share it!